The title “schools in” shows the simplisticness of the font but is made hard to read. The book tells us that the magazine is about exam results and success. The bright colours of the writing on the text book draw the eye of the viewer giving us the impression that that is important and the main theme of the magazine also the colour a yellowy/ gold also suggest the importance of the subject. 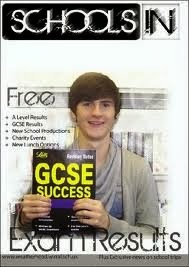 The photo of the pupil with hardly any back ground says that this could be anyone and everyone can achieve success. The casualness of the clothes also means that it could be anyone. The fact that the magazine is free will appeal to the audience of GCSE students also it having information they want to find out more on or need to know.